Here is my first attempt at designing a rabbitry. I did this more as an exercise at learning Sketchup than anything else, but I do plan to build from my finished design and use it. When finished, I'll post the full design so others can use it, if they wish. I'm not finished mainly because I have some questions I haven't been able to answer by reading. The main concept is for an inexpensive outdoor rabbitry, located in shade. The flooring wire is 1/2" x 2" 14 gauge GAW (galvanized after welding). It is cut in the full 12 foot length, from a 30" roll. The rest of the wire is either going to be 1" hexagonal poultry netting (chicken wire,) or 1" x 2" GAW wire. That's my first question, btw--is one of those better than the other for the sides and top? My second question has to do with the poo removal. The slopes under the top two rows are vinyl flooring, to allow poo and urine to move off to the side. I was going to build a gutter system, but after reading through this forum, I have the top row moving off farther than the middle row, and the bottom row allowing everything to fall naturally. I plan to use Miss M's model of deep bedding with chickens, so they scratch in the poo and eat the bugs, but I want to spread out the rows. I'm thinking of literally building this model as part of the wall of the chicken run. My question #2 is, does this angle look steep enough? (I do realize I'm going to have to flash around the wood, cut the cage sections down, and brace under the vinyl.) I just want to know if you think this is a viable model. The braces you see between the cages are meant to be movable, if you want to reconfigure the cages at some point. This design has four cages on each row, 36" wide x 30" deep x 18" high. I'm 6'1", so 30" is as deep as I can easily reach. 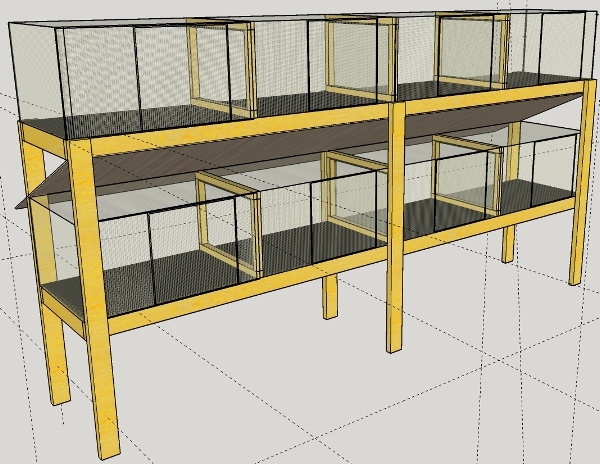 I was going to make the cages smaller, but this gives me four equal cages, all of them a really big space for a buck, or a roomy place for a doe and kits. The cost in materials is really not much between minimal-sized cages and these, so I'd rather give the animals a healthier environment. I have not included urine guards. That is my next question (#3)--how necessary are they? Some of the things I've read say they are necessary, and some not. The braces are 1" wide with wire on both sides, preventing direct contact. I realize the rabbits might pee through them and hit each other, but will they, and will it matter? Sorry to be ignorant on that. 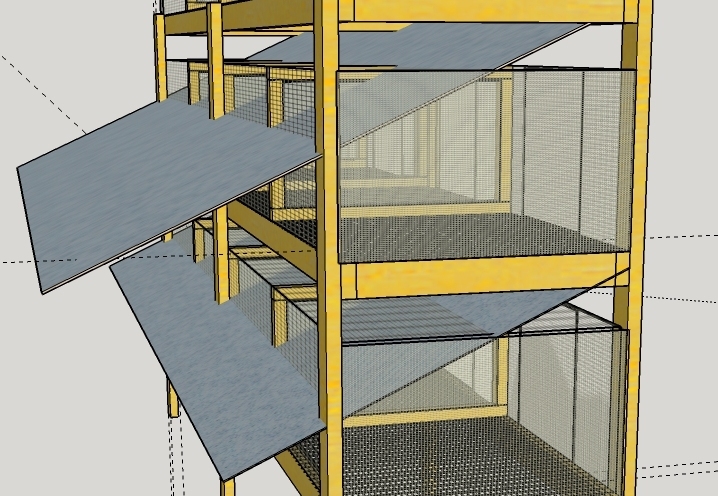 I don't think I can put urine guards on the front of the cages, since that is where feed bins and the doors will be. Any place else they pee is going to land on the ground, and that won't be a problem. In case anyone is wondering what I'm planning to do with this, this is a hutch for holding breeding animals and young growouts. Each row can hold a breeding quartet including young, but each cage is large enough for rearing young as well. Once animals have reached enough size to be safe in them, they will be moved to tractors for the rest of their time. I plan to begin breeding as soon in the year as I expect to have good grass for the tractors when the first kindles get to the right age to go into them. My ultimate goal is to be using the growouts for meat and fur, while breeding for show quality animals and pets. I'm planning to start with Silver Fox, possibly expanding to American Chinchilla over time. As both of those are rare breeds, I plan to do breed maintenance as well. For the present, I plan to keep all breeding stock in the cages. Temperatures in summer here in Maryland do rarely hit 100F. Summer averages are more like 90F, though, so heat is a major concern. I realize shade is critical, but am still working on plans to deal with heat. Just as rarely, winter temps occasionally get below 20F, but I'm less concerned about that. I don't plan to breed in cold weather. They will very rarely get below 10F. There are a number of other factors I'm working out, but these are the ones I'm working on right now. Any and all feedback appreciated. I'd guess by the time you have the space under the hutch for manure, plus the three 18" high cages, plus the space between the cages, it may end up all too tall to be comfortable? Those are all wire cages in a framework? Bunnies can get pretty heavy, I've used 2" x 4" on edge as framing and had it sag over a ten foot distance so a post had to be put in the middle. 2" x 6" didn't sag over the same distance. The hutches here are pretty much the same depth and we use tin metal roofing as the slope boards. A 4" - 5" drop from front to back (30" deep) didn't work nearly as well as the 7" - 9" slope. They extend about 8" out past the back of the hutches. We only have two layers to the hutch, so there's the drop through on the lower layer and then the upper layer falls to the back. You can bag it up and sell it, folks with gardens love the stuff. Or just let folks know you have it and they will come with buckets and shovels and take it away. We use 1/2" x 1" wire with the 1/2" side facing up. There's big square floor plates made with the wire & 2" x 2" pine and matching door sets (kinda like a floor plate but has doors) that set into a big standing frame made of 2" x 4"s and 2" x 6" floor joists? Would the big cross pieces be floor joists? We use refrigerator racks we get from our local dump as the backs and the side walls. We also scrounge the tin roof for the roof as well as the slope boards so a whole big hutch runs about $100 in parts. Thanks for all the info, hotzcatz! 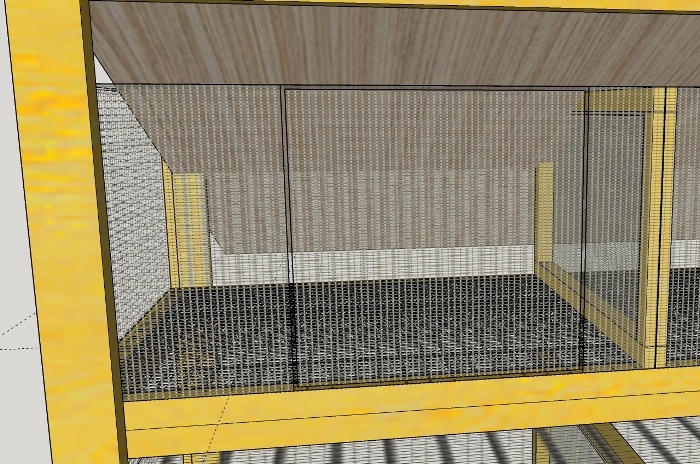 The cages are all wire, but instead of building each cage as a standalone, I have a 12' cage made of 1/2" x 1" GAW 14-gauge as a base, then top and sides of either poultry netting or 1" x 2". The frames in the middle can be moved, if I want to reconfigure cage sizes. They are 2x2 frames with poultry netting around them. The cross pieces are not joists. They are just 6' 2x4s, and the supporting legs are 2x4s. I planned to set the bottom legs down into concrete. If I just set them on the ground (and brace for wind,) I'll cut the legs off a bit. The top shelf is about 60" off the ground/floor, which will allow me to get my full arm's length in there. Good thoughts about the weight. If these are breeders, and I assume one large adult per cage plus food and water, I'm adding about 175 lbs to the weight of the cage for bunnies. That should (I think) be well within tolerance for a 6' length. Shouldn't it? I originally planned for sistered 2x4s for the legs, but decided one was more than enough vertical support. It's the horizontal support that concerns me. I'll have to see about refrigerator racks for sides; that's a great idea. I figured to use a different wire to save on costs. OTOH, poultry netting is really cheap. I like the idea of tin roofing. I thought that vinyl flooring might be both more slippery and resistant to urine over time. Do you have experience with that at all? And thanks for the slope info. That was exactly what I was looking for. I've planned it with a 12" drop front to back, so hopefully that will be enough. I really don't want to spend a lot of time scraping. I think I'm going to spend more than $100 for this. When I get the thing done, I'll post (along with the full 3D design--Sketchup is amazing) the materials list and costs. So any savings ideas are great. The drawing looks good. You do have a couple of possible issues that I can see. First, your design is going to be too tall. I would suggest cutting it back to a two tier. I am 6’5 and I struggle at times with the top row. I am including a link to my post, which has a similar design to what you are doing. You also want to keep your bottom cages up a little higher for cleaning under them and for protection from predators if they will be outside. Rats and racoons are also known to nip at the feet if they can get to them. I wouldn’t make the cages any deeper than 24 inches. Remember if one gets in the back corner, it will be a little further than that. You will thank yourself later. Many times I have struggled to get a dow out of the top, even at 24 inches. Also, make sure you leave plenty of clearance to get the cages in and out. This makes it much easier when you need to clean or replace one. On the doors, I would suggest going with a top hinge. If you want to save money, just use J clips that aren’t fully crimped. I do this on mine. I like it because I can hook the open doors on the top and they are out of my way as I move rabbits in and out. I use the little spring latches. You can see this on my layout. Using the plastic may be better than the metal, but no matter what you use some of the poop will stick. This is especially true with pellets since they have sugar products in them. Make sure you leave enough room to get a sweeping floor broom in to the top to scrap it down. I use gutters on mine, but I would prefer a different system to collect the waste. It is better than shoveling though. If they are going to be outside, then you will want a top. I used tin and it has worked well for me. 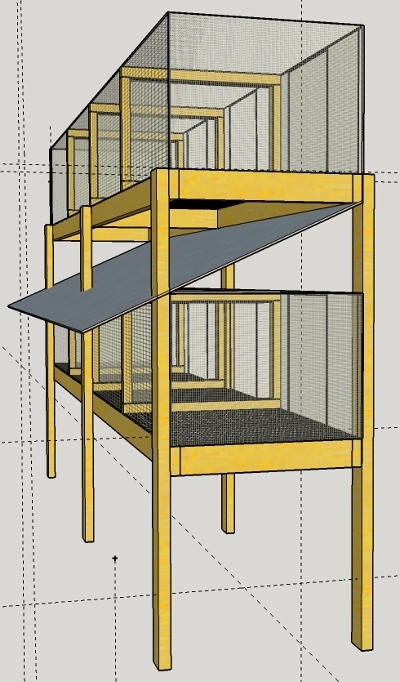 On the cage design, I use individual cages. This give me more flexibility to swap them in and out and use different configurations. With the length yo are running, you will need something to support the bottom. I do fine on the single cages that are only 30 inches wide. The bottom grow out cages had started to sag. I now have put three supports under each cage. I just use some quarter inch metal tubing. Sorry, but that is not pictured in my post since I just recently did that. As for the sides, do them as solid as you can afford. It will pay off in the end. Especially in the lower cages. The angle I use on my shoots was as steep as I could get it. Then I put up a back splash to stop it from over shooting the gutter. I don’t use urine guards, but if you have issues add them then. I've seen a hutch that had to vertical uprights (they used 2" x 2"s) set a half inch apart at the front of the hutch between the doors. When they wanted to change the layout of the hutch, they just slipped a piece of plywood between the uprights to section it into two spaces. Seems easy enough and I may try that with the next big hutch. The current hutch has big feeder-walls which were supposed to be the dividers between the spaces, but the feeders were too big. Other than too much feed mildews in our climate (hot and humid), the babies are able to squirm through to the other side and this is when they are small and don't have a tattoo yet so who's who can become confusing. 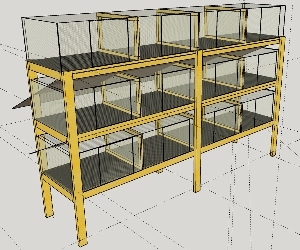 I should work on the website some more, I'd been doing hutch building articles, but only got the first several hutches we used and not up to the current modular system yet. From what I've noticed, bunny hutches get rebuilt about every three or four years, posts set in concrete may be too much fixed in place as well as the rot issue. To address the fall over in the wind issue try getting a couple of concrete stakes and driving those into the ground at an angle at each foot and then nailing those to the legs. Or if it's being built under a tree, it could have a rope or chain between it and the tree. Also, if the wood post were set on something that doesn't allow moisture up into the wood, it does a lot to keep them from rotting. A bit of tarpaper or a bit of galvanized sheet metal would do. Our hutch is set on some scraps of Trex decking, that's made of something plastic and waterproof. The Trex scraps are set on a concrete block. Concrete wicks moisture as well as wood, so they shouldn't be in contact with each other if the concrete is set on the ground. hotzcatz and TheChad are both right; it's too tall. I could do three high with trays, but there is no way I want to do that much extra work. I had planned to have some of the legs down in concrete, but that leaves no room under the bottom layer for manure--and I don't want to get down on my knees every time I get a rabbit. hotzcatz, I like your comments about the bases. I'll probably set them on small pavers, and anchor them with rebar stakes. I've reconfigured it for a two-tier hutch. The floor of the top hutch is now 5' off the ground, which is a very comfortable working height for me. The floor of the bottom hutch is 30" off the ground, which makes it a manageable height, and leaves plenty of room for manure. It also leaves a 12" fall-off for the vinyl slope, which will be kitchen flooring on top of 3/16" plywood, with vinyl flashing for the legs. The width is now 24", which means the cages are going to be 24x36, if I stay with four cages per row. By moving the dividers, I can reconfigure to two 24x72 cages, one 24"x12' cage, or any combination. That's not as roomy as I was hoping, but I don't want to be struggling to reach the back of the cages. I've also shortened the length of the vinyl piece that hangs off the back. It's mounted on 3/16" plywood, and the vinyl that is cut to go around the legs will flash up the legs to direct manure around them.